If House Speaker Joe Straus decides he wants to run for statewide office, he's got a lot of work to do. Half of the state's voters don't have an opinion about the job he's been doing. House Speaker Joe Straus, R-San Antonio, has been one of the top figures in Texas government since 2009, but you wouldn’t know it from his poll numbers. Like the speakers before him, he’s a cipher to many Texas voters. When asked to grade the job Straus has been doing as one of the most important officials in state government, a large number of Texans have either a neutral reaction or no reaction at all. That’s normal for a speaker — outside of the House district that elects him. The party and place marker after his name might as well be “R-Bubble” — a Republican best known in the Austin bubble where politicians, state workers, lobbyists and the state’s political media congregate. In a news media scrum in his office after he announced his decision, Straus sounded like a guy on an exploratory campaign. “I plan to be a voice for Texans who want a more constructive and unifying approach to our challenges, from the White House on down,” he said. But Straus has a lot of work to do if he ever wants to run for statewide office in Texas. He’d have to introduce himself to a lot of voters who don’t know him, and he’d have to do it in a way that’s attractive to the voters in what is often a very conservative Republican primary. One voter in five doesn’t know enough about Straus to register an opinion on the job he’s doing, according to the latest University of Texas/Texas Tribune Poll. That number has been as high as 26 percent within the last 12 months. Another 29 percent of voters neither approve nor disapprove of the job he’s doing. Combine those numbers and 49 percent of Texas voters can’t or won’t say how they feel about this guy. Among the roughly half of Texans who have an opinion on Straus, he is slightly underwater, with more people disapproving (27 percent) than approving (23 percent) his work. Those aren’t unusual numbers for the speaker, but they’ve changed over the last year, as he has become more outspoken against social conservative legislation like the “bathroom bill” and in favor of business and public school-friendly legislation. 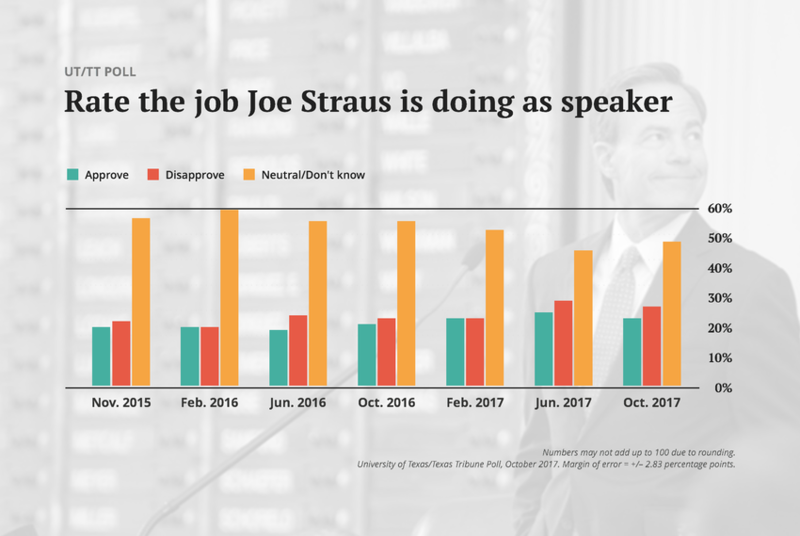 The number of people with neutral impressions of Straus has slipped from 56 percent to 49 percent over the last year. The number of voters who disapprove of his work has risen four percentage points. While only 16 percent of voters disapprove strongly of the job he’s doing, the numbers are highest among Democrats (20 percent), as you might expect, and Tea Party Republicans (32 percent). That second group can have outsized influence in Republican primary elections, and it animates the speaker’s strength and weakness with Republican voters. Only 3.5 percent of non-Tea Party Republicans disapprove strongly of the work Straus is doing. His numbers with that group look solid: 39 percent approve, 9 percent disapprove and the rest are either neutral or don’t have an opinion. Contrast that with the Tea Partiers, 24 percent of whom approve of Straus’ work, 43 percent of whom do not. Right now, he’s the personification of the chamber of commerce wing of the Texas GOP, often juxtaposed against Lt. Gov. Dan Patrick as the embodiment of the movement/social conservative wing. If the speaker wanted to run in a Republican primary, he’d have to get more of the folks on his end of the Republican pool to the polls. In recent election cycles, the most conservative Republicans have dominated. That’s how Patrick, then a state senator, won the GOP nomination for lieutenant governor in 2014 over three statewide officials — by running to their right. Other statewide officials, like Gov. Greg Abbott and Patrick, can brag that their positive reviews outnumbered their negative ones in the latest poll, Abbott’s by 15 percentage points and Patrick’s by 5 percentage points. The state’s two U.S. senators were, like Straus, underwater. But all of the others had relatively low numbers of neutral/don’t know voters. They’re known, and the speaker isn’t. That’s been an advantage in his current job, but it’s a hurdle between him and the next one, should he ever decide to run for statewide office.